I love living in Clintonville. I love the owner of my local deli, Smith’s, who’ll sell me a $6 Reuben even as he’s preparing to marry off the 3rd of 7 children. I love the community center and art fairs. I love living in a place with trees, even when my house is being hit by acorns. I love the hole-in-the-wall Chinese place on Kenny that I’ll be eating from later tonight. I love my neighborhood full of dogs and little free libraries, and the bookstore just up the road. And I love the people of this community, now more than ever. Sunday night my wife and I attended a candlight vigil. This wasn’t an anti-Trump rally, or a group of people out to abolish the electorial college. It was a group of our Clintonville neighbors coming together and saying we will look out for one another. Walking from the Whetstone Community Center to North Broadway we were surrounded by people of all ages: from families with young to children, to college students and retirees. My wife and I didn’t have mason jars for real flames, so we brought some battery powered candles (just as well since I probably would’ve set my notebook on fire). The walk was pretty quiet at first, the group of us moving at a slow shuffle. Somewhere between Smith’s and Torrence things started to get a little more lively. 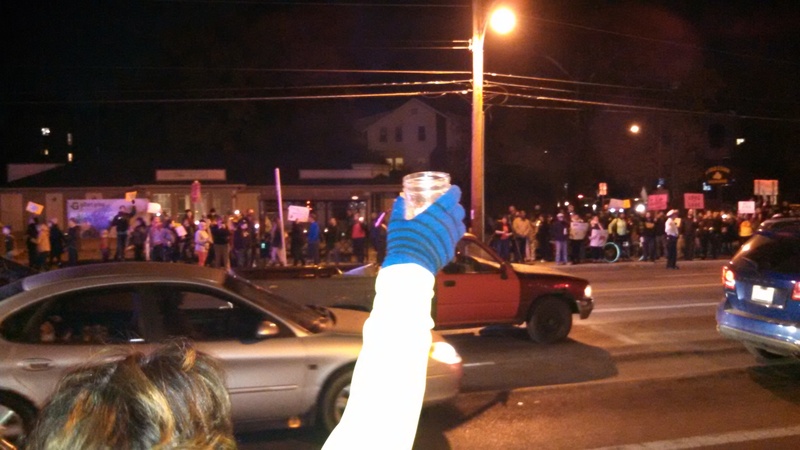 Cars honked in support as they passed, marchers across the street cheered “this is what democracy looks like,” and local businesses made a show of support (the Global Gallery handed out coffee on a cold night). On North Broadway there were drums and carhorns and cheers of “Love Trumps Hate.” A small group of police showed up to help people cross to the other side of the main road. As I stepped into the crosswalk I heard an officer remark “you guys keep being this cool we’re never going to make national news.” In truth the whole evening was pretty tame. There were a few people who shouted their support for Trump (more as a matter of fact than anything else). There some individual calls of “not my President” and “we reject the President-elect” but these were the outliers, not the rule. Mostly we chanted about protecting the rights of women, of minorities, of different relgions and love in all its forms. The police were respectful and helpful, and the mood anything but antagonistic. Frankly it was a welcome change after the strange week we’ve all had. My favorite moment of the night was walking back to the car. We were a few steps behind a mother and her 6-7 year old son. The son was holding a big “Love” sign while his mother explained the right to protest and how it can be important to show people how you feel. There’ve been a lot of people saying that we shouldn’t protest, that we need to accept the results of the election and give the President-elect a chance. I do accept the results of the election, even if I have a hard time typing the words President Trump right now. That’s not the issue. If you take the President-elect at his word then you have to take on board the policies he said he would enact. This is a man who advocated for war crimes, who called for a total ban on muslims coming into the country. He has appalling attitudes toward women, and only a passing relationship with objective facts. Maybe once he realizes what the job actually entails he’ll change. A lot of people who’ve sat in that office certainly have. Being President is an awesome responsibility, but we have responsibilities too. We have a responsibility to protect the rights of the people around us from those who might seek to take them away. That starts at home, in the places we love.